Essiac Tea Maintenance Dose: The maintenance essiac tea dosage is 6 oz. of tea per day, and should be taken in two separate 3-oz. doses. Who should take maintenance dose? The word 'maintenance' gives your clue. Anyone who wants to maintain their current health. Administer the essiac tea maintenance dose for at least 6 months after your test results have returned to normal. Many people choose to continue the maintenance dose indefinitely to maintain their good health. Some also take a maintenance dose of essiac tea as a daily preventive supplement, even though they have no health problems. Essiac tea is abundant in many minerals and is a healthy part of the daily diet. In fact, in many cultures some of the ingredients are eaten regularly in salads, such as watercress. Other ingredients are taken as a tea on a regular basis, such as burdock root. Essiac works much like a food in the body--it's not unnatural like taking a pill or powder can be. Although at first it can feel like a bother to take essiac every day, it's not as bad as it seems at first, especially when you only need to take it twice per day. The hardest part can be making sure the empty stomach rule is followed. That is--essiac has to be at least 2 hours after meals, and at least 1 hour before meals. Breakfast at 7am. You can take essiac at 9am (2 hours later). Snack at 11am. Lunch at 1pm. You can take essiac at 3pm (2 hours after food). Essiac at 6am. Breakfast at 7am (1 hour later). Dinner at 7pm. Essiac at 9pm (2 hours later). How Long Should I take Essiac? The length of time you should remain on the essiac tea maintenance dose will ultimately be your decision. 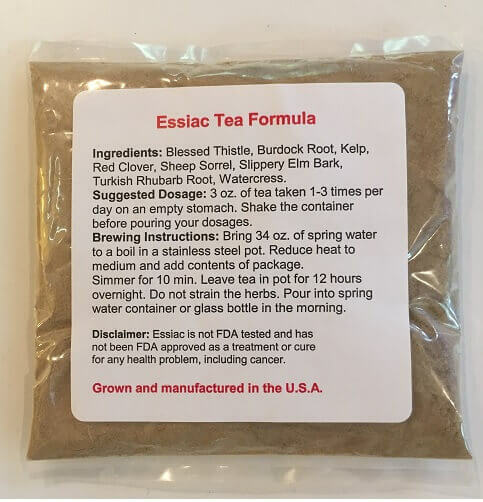 At discount-essiac-tea.com, our staff chooses to stay on essiac at all times to maintain our good health, and we encourage our friends and family to do the same. Essiac can be taken indefinitely, so it's up to you to decide whether to continue on the maintenance dose or to stop using essiac you've achieved good health. Note: The essiac tea maintenance dose that we're suggesting is measured in ounces of brewed tea (not the powder). All doses should be taken on an empty stomach. Essiac was tested by people with an empty stomach, and this will ensure maximum absorption of your essiac tea dosage. This means you should avoid eating for 2 hours before and 1 hour after taking essiac for best results. Click here to order the 1 oz. packets which are the best to use with the maintenance dose.